How do I add Peer-to-Peer Fundraisers for a Giving Day? From your Giving Day Dashboard, expand the sixth tab that says "Add Fundraisers" to recruit P2P Fundraisers for your organization. Click the "Add Fundraisers" button to start inviting them. After clicking the "Add Fundraisers" button this form will appear where you can enter the first name, last name, and email address for the fundraiser you would like to invite. You can invite multiple people at once by clicking the "+ New Fundraiser" button. Once you've added all of your fundraisers, click the "Next" button. 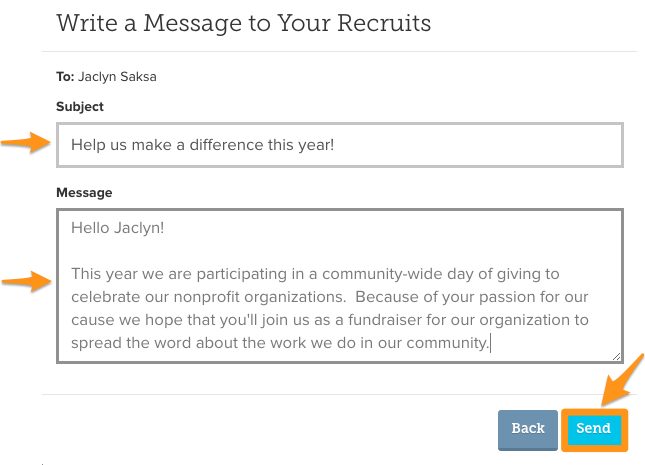 After clicking the "Next" button you'll be able to compose the custom message that your fundraisers will receive in their invitation email. You can customize the email subject and message before sending it off to your supporters. Once your message is ready to send click the "Send" button.